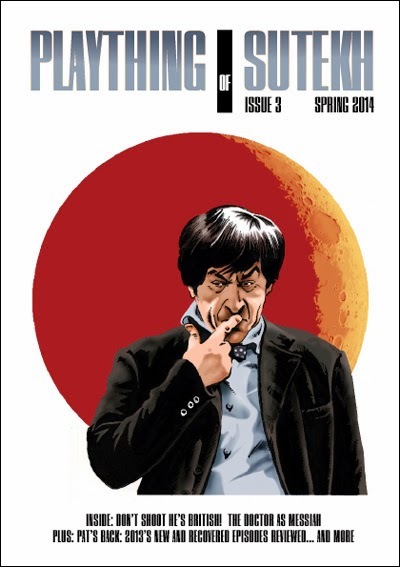 Issue 3 of the Doctor Who fanzine Plaything of Sutekh is now available. Don't Shoot - He's British! - Matt Kilburn looks at the cultural influences on the Doctor's identity. Seasonal Gear Changes - Jez Strickley spots similarities between Terror of the Zygons and The Seeds of Doom. Pat's Back - Were they worth the wait? A look at the two recently recovered Troughtons. Please add your address in the notes section. You can also pay by cheque - please drop us an email for the payee details. Price £2.40 - please add postage below. Plaything of Sutekh is a non-profit publication. UK: postage included / Elsewhere in Europe: add £1.70 for 1 issue or £3.00 for 2 or 3 issues. / Outside Europe: add £3.90 for up to 3 issues. Is it still possible to buy issue 1? I enjoyed the second one. Issues 1 & 2 are still available from the fanzine's blog. Great - I've now bought both to complete the set. Gotta catch 'em all!